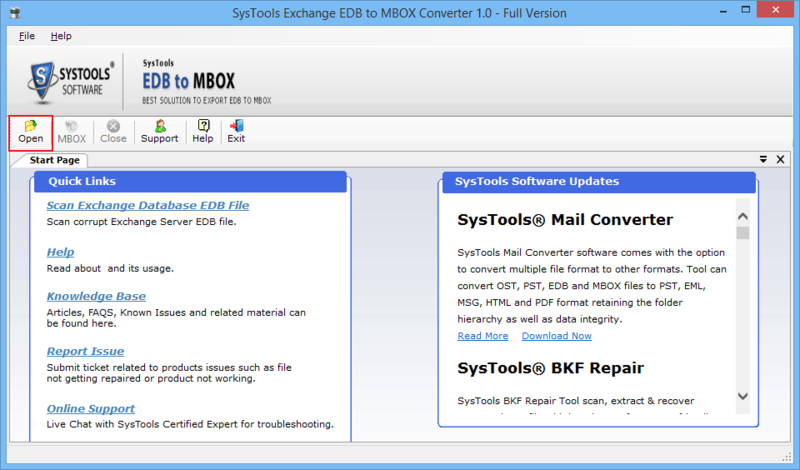 The EDB to MBOX Converter Software is compatible with all windows operating. So user can install the tool on any version like Win 10, Win 8.1, Win 8, Win 7, Windows Vista and Windows XP etc. 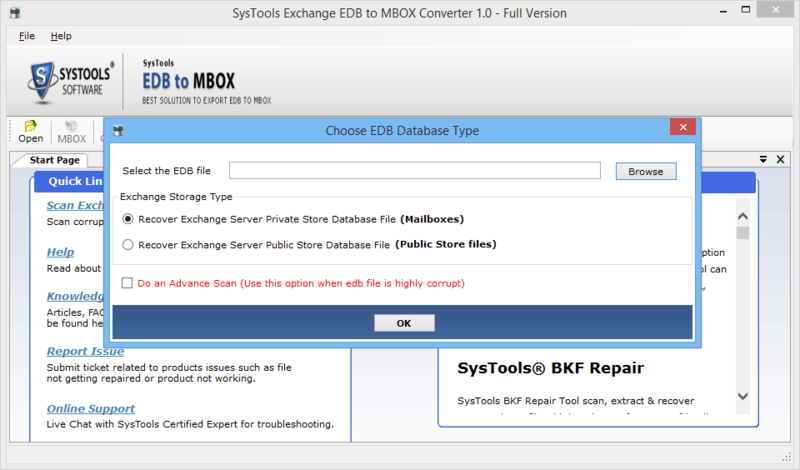 EDB to MBOX migrator utility gives dual modes of scanning for repairing data from corrupted Exchange .edb files. Whilst the default Quick scan retrieves data from nominally corrupted Exchange data files whereas Advance mode of scanning retrieves data from the highly corrupted EDB files. 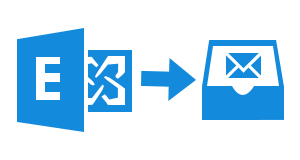 The software enables to move Exchange .edb to MBOX file format after retrieving data from both private (priv.edb) and public (pub.edb) store of Exchange Server. Users can select the required MS Exchange saved before beginning the procedure of scanning process. 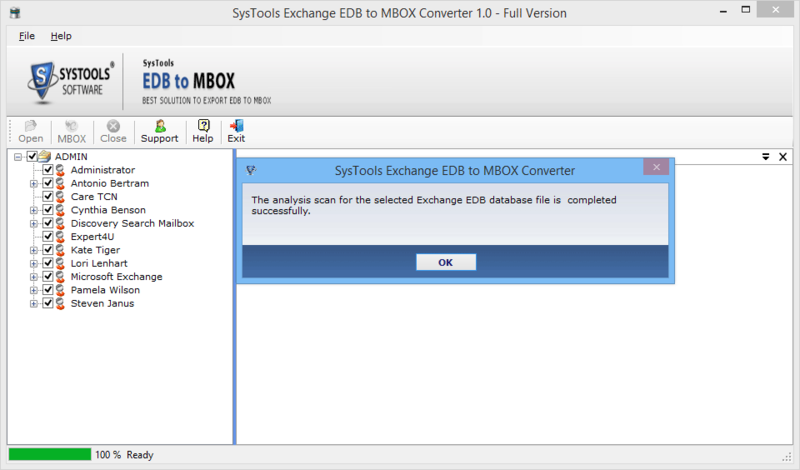 Once the edb to mbox utility scans and retrieves the data from MS Exchange EDB file, the complete file items are revealed at left side of the application panel. Users can preview the required mailbox and items that are present in mailbox. 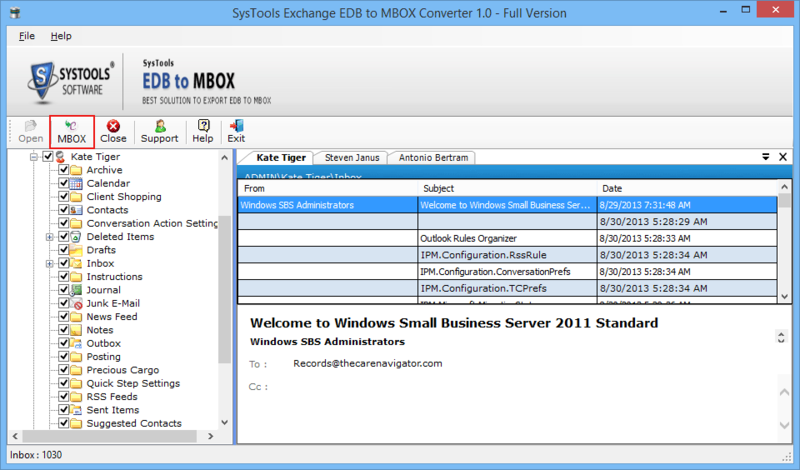 Exchange to MBOX converter provides the conversion of multiple EDB mailboxes to .mbox format. 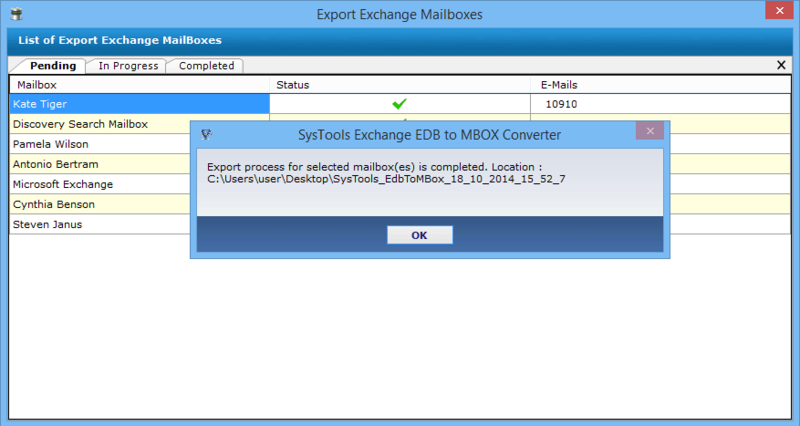 Users can move all EDB mailboxes at a time to MBOX file format without installation of MBOX supporting clients. The application permits users to move desired mailboxes and selective items from the Exchange mailboxes. Users can convert desired data items by checking/unchecking the check boxes that are present in front of every item. The utility displays summary report of the whole conversion procedure. 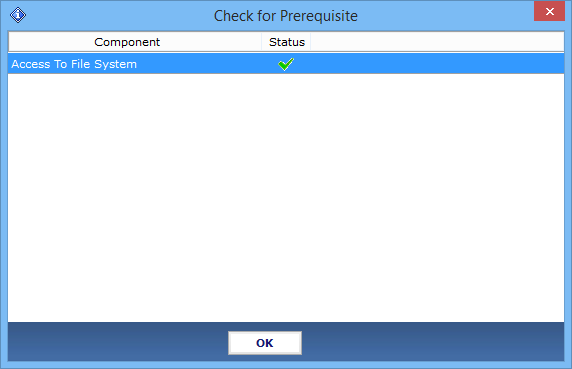 It shows the status of the export procedure, pending, as well as mails, which are moved to MBOX file format. It makes easy for users to understand the whole process of conversion. Can I move only few emails from my mailbox to MBOX file format? Yes, the application allows migrating selective items by simply checking the needed emails and then, converts them completely. Is there any file size limitation on Exchange EDB file that is to be converted? No, there is no any file size limitation executed on the Exchange EDB file, which has to be migrated to .mbox format. I want to migrate corrupted EDB file to MBOX format. Is it likely to do so? 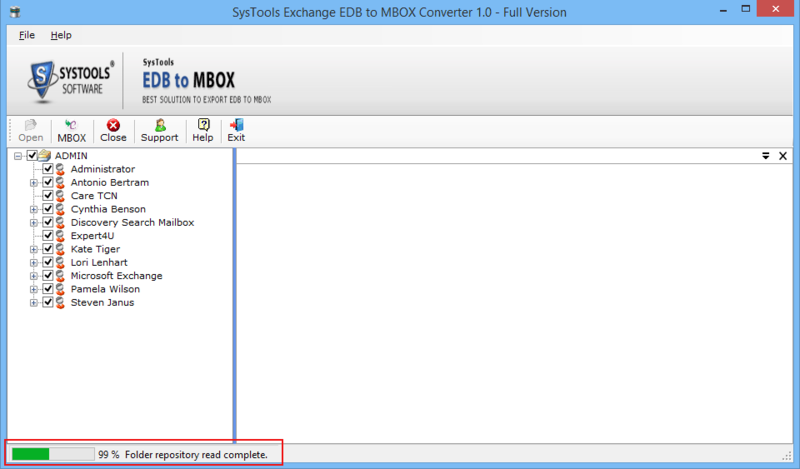 Yes, you can transfer corrupted EDB file to .mbox format with the help of Exchange mailbox to MBOX converter application. How does Advance scan mode in the utility works? The advance scan mode retrieves data from highly corrupted or damaged .edb file. 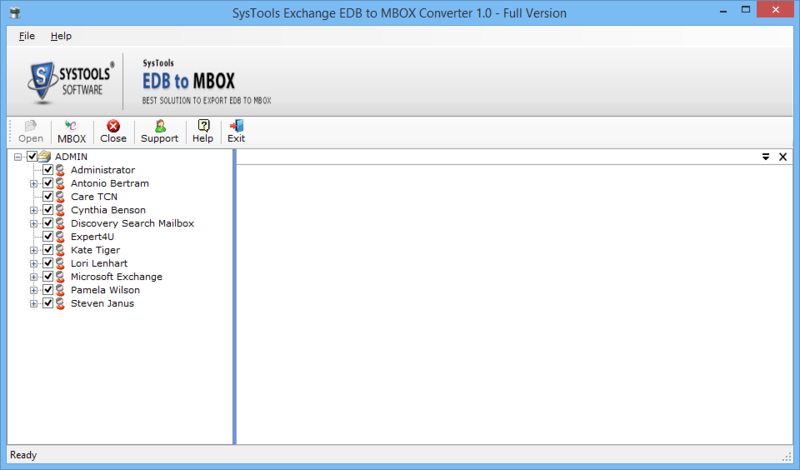 Start » All Programs » Exchange Emails to MBOX Converter » Exchange EDB to MBOX Converter. Select Open option to select Exchange EDB database. After selecting an option of "Open,” the application will show the following options. The option to do Advance Scan in situation of highly corrupted EDB files can also be triggered from the particular screen. Load EDB data files, check an option and click OK. The utility will view the scanning procedure on the bottom left side of screen. After successful completion of scanning, a pop-up screen-showing message of analysis scan end will be shown. Click OK.
Users preview from scanned .edb file will be revealed on screen. Double-click for each user to preview details of database within it. Choose the required folder, which is converted to MBOX, and Click on the option of MBOX given on header of screen. 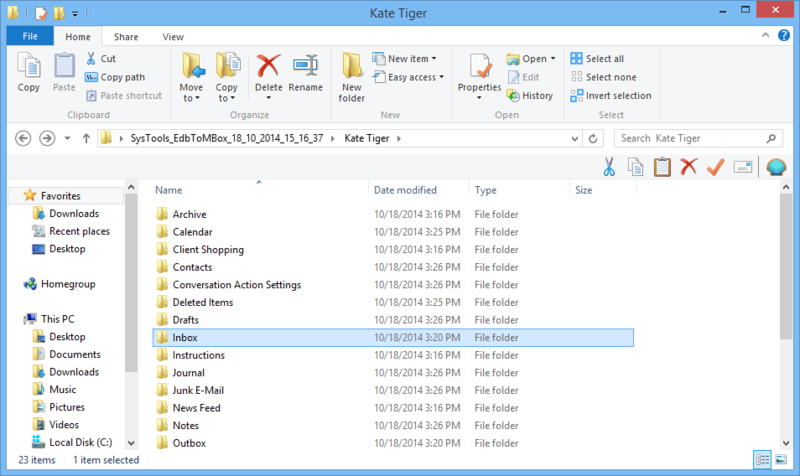 Browse for folder to store .edb database that is converted to MBOX and click on OK. 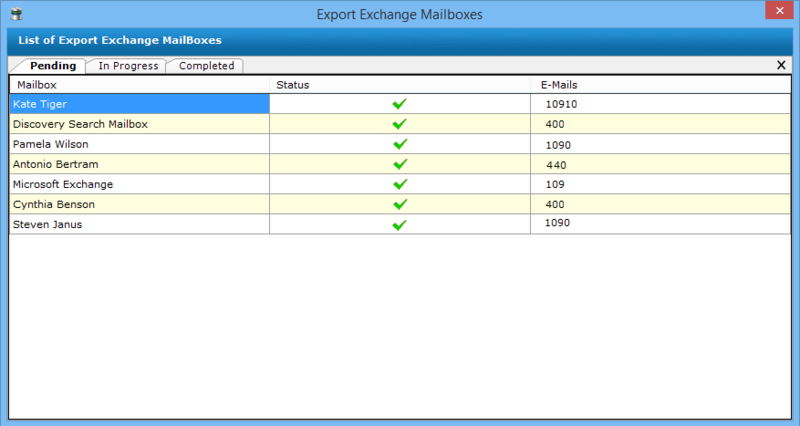 The application will display complete list of exported MS Exchange mailboxes. Another screen displays list of exported MS Exchange mailboxes along with status and number of mails converted to .mbox format. A rapid about the effective conversion of EDB to MBOX with the stored location path will also be shown and click OK.
Now, navigate to location from where you stored converted .edb into MBOX format. 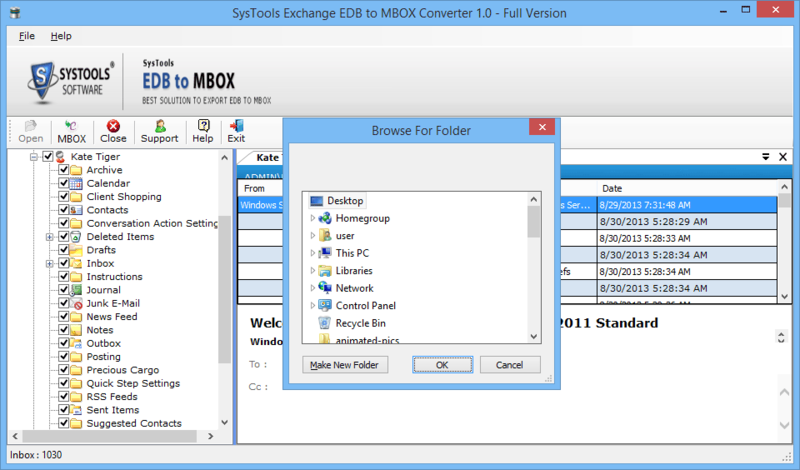 "The EDB to MBOX Converter is well-organized tool for Exchange to MBOX migration. It permits us to recover data from large sized or corrupted Exchange files and move it into .mbox format without data loss." "Not all third party tool gives satisfactory results. But this EDB to MBOX Converter proved us totally wrong as it recovers data from corrupt .edb files in an actual way and moves it into MBOX file format."